Perfectly preserved history makes a great film set! If you visit Castle Combe on a quiet afternoon in late summer, you may feel that something strange is happening to you. I've been here before, your mind will say, even if the rest of you is quite sure you have not. And though it may sound strange, your mind is not wrong. 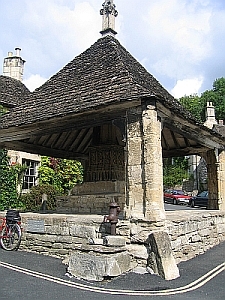 You may not have visited Castle Combe in person, but if you like to watch movies or TV, you'll have seen it many times. Agatha Christie's super sleuth Hercule Poirot retired here in The Murder of Roger Ackroyd. Diana Rigg and Patrick Macnee could not find a more English (or more romantic) setting to film 60s cult show The Avengers, and Roger Moore arrived to play The Saint. Dr Dolittle talked to the animals and Robin Of Sherwood fought the evil Sheriff of Nottingham. 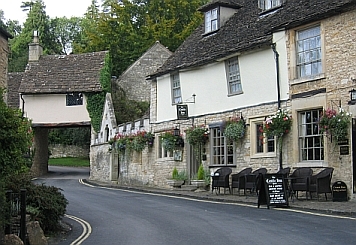 More recently, in 2007, Castle Combe was cast as the village of Wall in the fantasy romance Stardust. And in autumn 2010 Stephen Spielberg announced that he'll be shooting his new film, Warhorse, in the village. 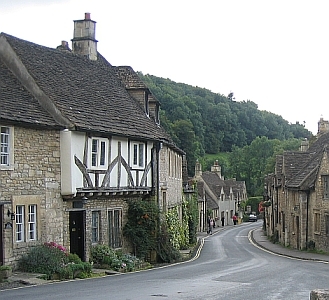 If movie star spotting is one of your pastimes, then Castle Combe is the ideal place to be. So what makes this village so appealing to movie makers and visitors alike? Castle Combe looks as if it's been caught in a time warp. You'll see no aerials, no satellite dishes, no modern street lights and very few cars. But despite that olde worlde charm, the village is a busy community, catering cheerfully to its many visitors, who come to admire the old houses, the fine medieval church and the beautiful market cross, in whose shadow weekly markets have been held since the 14th century. And what about the castle that gave the village its name? That goes waaay back ... all the way to the Stone Age! 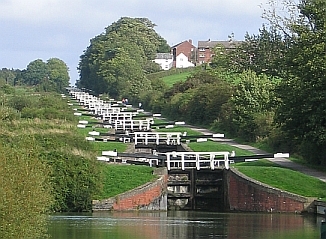 It once stood about half a mile to the north-west of the Manor House, on a ridge overlooking the Bybrook valley. The steep sides of the hill make it hard to attack and the castle itself was protected by deep ditch, which can still be seen. After the Neolithic peoples came the Celts, who used the fort as a base from which to fight the Romans. And then - at the end of the Dark Ages - it became the home of the Saxons, who brought their name Cumbe (meaning valley) to the area. The Normans - with their keen eye for great defensive sites - began building a castle here in 1140. But in the 14th century this lofty site was abandoned in favour of a Manor House in the valley. And today, only an overgrown site and a few bits of masonry remain ... and the village's name, of course. For your perfect English holiday or weekend break, you can stay in the 4-star Manor House Hotel in the village. Built in the 14th century, it stands in 365 acres of garden and offers 48 rooms. Or stay next door in the beautiful Mead Cottage ... English Bed & Breakfast at its best! And if your mind yearns more for speed than romance and history, then don't forget to visit the Castle Combe motor racing circuit. Try your skill on the skid pan, or take the wheel for a high-speed lap around the circuit. And when all the noise and excitement have exhausted you, restore your flagging spirits with a perfect English afternoon tea in the village. You'll never know: Mrs Emma Peel or even Hercule Poirot may sit at the table right next to you! 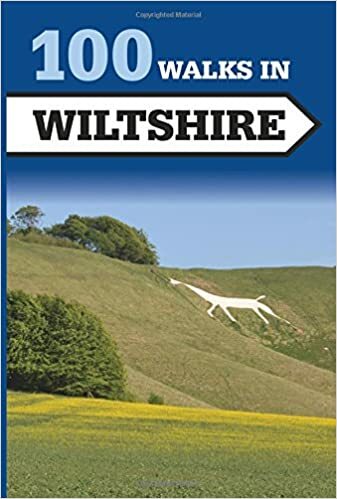 For more places to visit in this beautiful county, return from Castle Combe to the Wiltshire page.